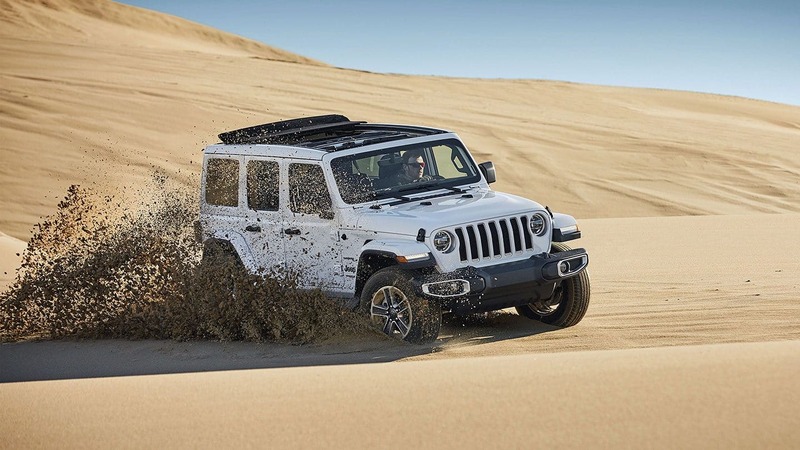 A vehicle doesn't just get lucky in winning the 2019 MotorTrend SUV of the Year, and the 2019 Jeep Wrangler proved this by ferociously earning it in every category. Whether you're talking about pavement- or dirt-obliterating specs, safety- or assistive-tech, style- or heritage-points, this Wrangler has it in spades! On top of everything it is bringing in 2019, Jeep further allied with Mopar to produce parts expressly for the 2019 Jeep Wrangler, which is a much better result than when an aftermarket part company takes a wild guess at materials, design, and color. It has ingredients like covered cargo-floor storage, a drainable wash-out cabin floor, Dana brand HD front & rear axles, trapezoid wheel flares, and safety highlights like Adaptive Cruise Control and Blind Spot Monitoring, to mention a few. The 2019 Jeep Wrangler blends in all manner of cool things, like a novel open-air concept, dense steel skid plates, tow hooks, the Uconnect system, an available front-bumper winch, a possible Alpine Premium Audio System, and the Wrangler's characteristic fold-down windshield. With 3 beneficial 4x4 systems to pluck from and put into use, a fan-favorite Rubicon model, two engines to decide on, and the ability to plow through up to 30-inches of water, the Wrangler is obviously going for (and getting) all the gold stars to be had! How much power can the Wrangler deliver in 2019? 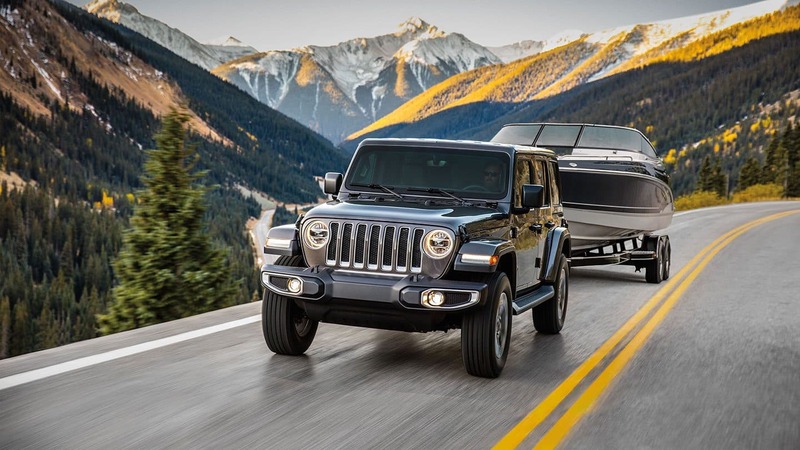 Look to tow up to 3,500-lbs and haul a payload of up to 1,000-lbs with the 4-door 2019 Wrangler, no matter the engine & transmission combination! Those numbers become 2,000-lbs of towing if the Wrangler is in the 2-door configuration. A 3.6L V-6 engine with ESS makes a hefty 285-horsepower and 260 lb.-ft. of torque, and is found is standard with a 6-speed manual transmission (8-speed automatic optional). The 2019 Jeep Wrangler could, however, be made with the all-new mild-hybrid 2.0L turbo-4, an engine that gets 270-hp and 295 lb-ft of torque (using eTorque) and uses an 8-speed automatic transmission. Besides those engine strengths, there are also three suspension types: Normal Duty, Performance, and an HD-Suspension that includes Gas Shocks! Further, both Sport model versions and the Sahara model could opt for the Trac-Lok limited-slip rear differential that extends additional torque and adhesion in slippery conditions. What are some fun and integral features of each model? There are four major models of the 2019 Jeep Wrangler: the Sport, Sport S, Sahara, and the Rubicon. 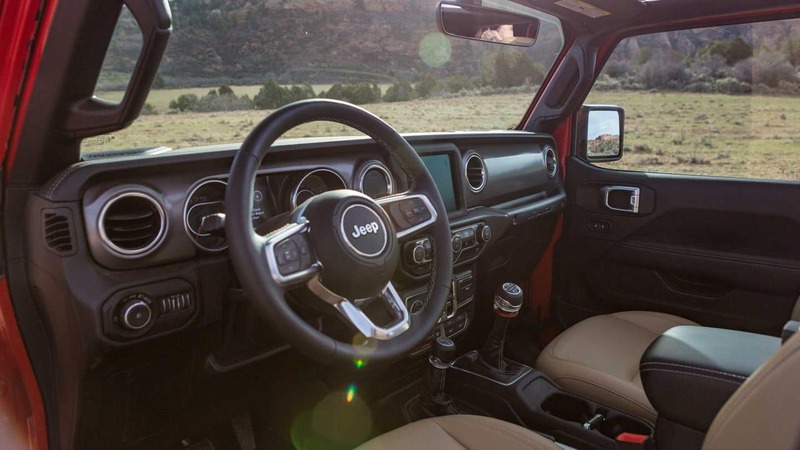 For all Wrangler models, there is locking glove compartment & locking middle console, a comprehensive Uconnect touchscreen system (from 7" to 8.4" in size), Apple CarPlay/Android Auto with pinch-and-zoom gestures, and a Push-button Start. The complete feature array is huge, but here are some old-favorites we think are great: grab handles, a fold-down windshield, the grille with seven slots, circular headlamps, and outside hinges on the demountable doors. There is even an available Trail Rail System that employs matching aluminum rails in the floor and a different trail-mounted rail on the partition of the tailgate, and a detachable cargo level for covered storage options. Dana-brand HD axles support the Sahara models, which also can obtain the dexterities of a Selec-Trac 2-speed transfer case, which conveys a 2.72:1 low-range gear ratio and returns full-time 4WD into the mix. Both the Sahara & Rubicon models permit a new feature that works even at up to 60-mph: an accordion-fold Sky One-Touch powertop! 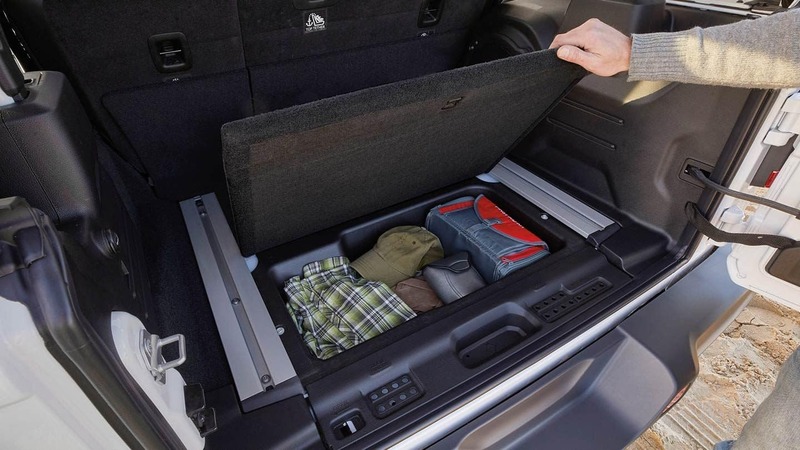 The Wrangler can convert into a base office essentially wherever it is by a 4G Wi-Fi Hotspot with a 50-ft range of Wi-Fi for eight laptop/smartphone peripherals! The 2019 Wrangler Rubicon model possesses 33" BF Goodrich KM All-Terrain tires, then proceeds with more in the form of Heavy-Duty Dana 44 axles (both), a disconnecting front sway bar, off-road rock rails, and locking electric front & back differentials. A 4:1 low-range gear ratio is waiting to be used on the trails via the Rock-Trac NV241 two-speed transfer case, in conjunction with an 84:1 crawl ratio (on the manual transmission)! Would you mind speaking to the safety of the Wrangler for 2019? Let's go through the thorough suite of safety within the Wrangler! There are 75 points of safety for 2019, originating with a standard ParkView Rear Back-Up Camera, electronic roll mitigation, as well as brake traction control, Hill-start Assist, Trailer-sway Control, and electronic stability control. Think about installing the always-good-to-have Adaptive Cruise Control, Blind Spot Monitoring, Rear Cross Path Detection, a Keyless Enter 'n Go passive entry system, Forward Collision Warning with Active Braking (part of the Advanced Safety Group package), and a ParkSense Rear Park Assist System. 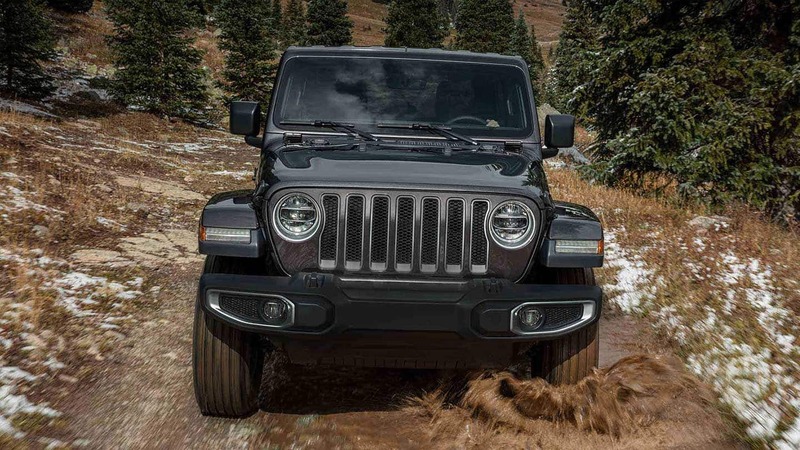 By design, the Jeep Wrangler has high-strength steel beams built right into its structure, standard front & side airbags, and a Tire Pressure Monitoring System, so it's made as safe as possible to protect you! There is a special edition this year denominated the "MOAB" that plants components such as 17" Low-Gloss Black aluminum wheels sporting 32" Mud-Terrain T/A tires, a 9-speaker Alpine System, front/rear black tow hooks, and authorizes access to the Premium Lighting Group. 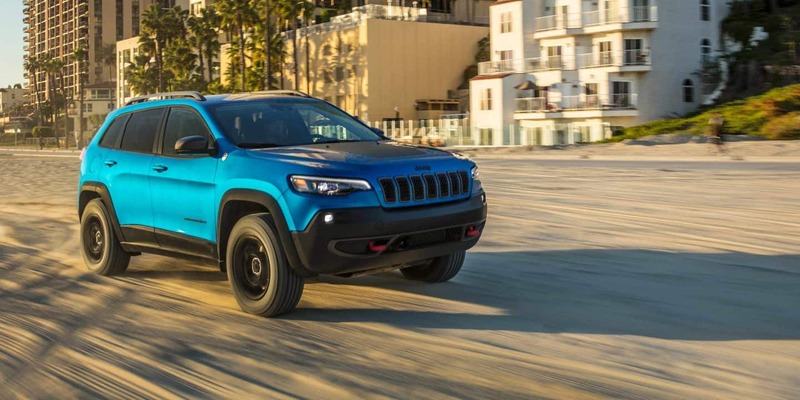 It was named after the rocky trails that inspired it in Moab, Utah, and it has steel bumpers, Uconnect 4C NAV with 8.4" touchscreen, a dual power-dome vented hood, the Selec-Trac Full-Time 4x4 System, and Jeep Performance Parts rock rails! We know you're excited about this model (and probably all models) of the 2019 Wrangler, why not fill out the inquiry form below and get the process going?